It’s one thing for President Donald Trump to be an American embarrassment. For better or worse, he is the crazed uncle who stays in the basement at Grandma’s house. He’s the American family’s shame. So Trump’s first visit overseas as president is making all of America look bad, and if you ever wondered why the president stays on Twitter, look no further than the message he left in the guestbook of Israel’s national Holocaust memorial center in Jerusalem. 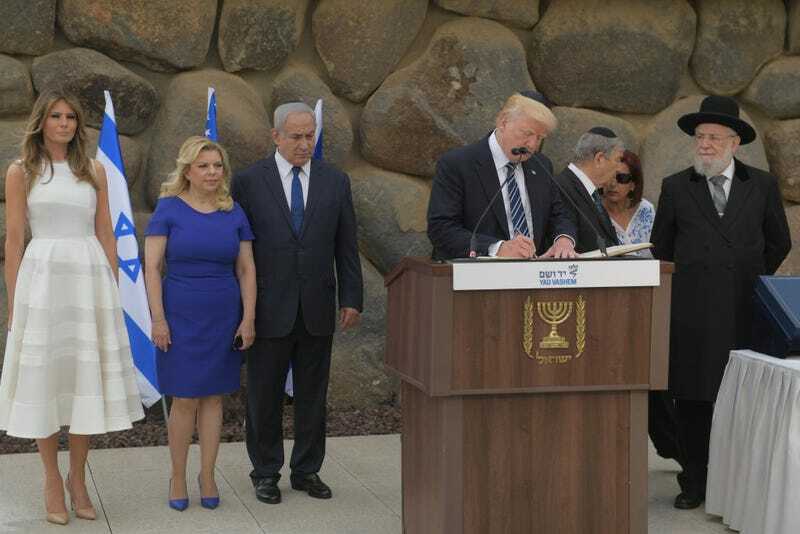 “It is a great honor to be here with all of my friends - So amazing and will NEVER FORGET!” the president wrote after visiting the Yad Vashem World Holocaust Remembrance Center. I mean, seriously, we all know that this president is a few fries short of an acceptable medium, but having his lack of depth exposed on a global level feels like America’s not-so-secret secret is getting out. Let our children come here, and know this history, so that they can add their voices to proclaim “never again.” And may we remember those who perished, not only as victims, but also as individuals who hoped and loved and dreamed like us, and who have become symbols of the human spirit. Maybe one day America will have a president who can act presidential, but for now I think 140 characters is about all we can expect.